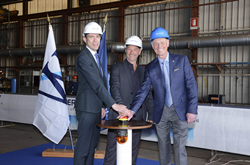 Fincantieri’s Vice President of Ship Repair and Conversions Andrew Toso, Shipyard Director Gianni Salvagno, and Windstar Cruises’ Vice President of Expansion Projects John Gunner in Trieste, Italy. The considerable experience gained with major naval projects undertaken over recent years, and the Windstar program that we are officially starting today, consolidates Fincantieri’s position as the reference point worldwide for this kind of highly sophisticated and complex operations. Today at Fincantieri’s shipyard “Arsenale Triestino San Marco” in Trieste, Italy, John Gunner, Vice President of Expansion Projects for Seattle-based Windstar Cruises, pushed the button which activated the torch to make the first cut in the new steel that will become the first of three new ships sections as part of Windstar’s $250 Million Star Plus Initiative. To learn more about authentic small ship cruising with Windstar or to book a cruise, contact a travel advisor or Windstar Cruises by phone at 1-800-258-7245, or visit http://www.windstarcruises.com.